He claimed 10,800' Mt San Jacinto shouldn't be visible from a 150' high viewpoint in Malibu, CA, 117 miles away if the earth is curved. I claim it should be, and his imaging -- despite his accompanying narrative to the contrary -- shows what is expected on a curved earth and not a flat earth. The graphic I posted was in error. For that reason, and because of the request not to debate in the Media forum, I deleted it. But I'm more than open to discuss it, Tom. I was going to respond to the image you created but didn't post here. I think you see where the error was, and so I won't bother with it. Lets see. I'll go through the items in the video one by one. Now he's talking about infrared being able to see through the atmosphere. However at 11:25 he says "If the earth was curved, we shouldn't be able to see Mt. Jacinto. Even though it is 10,600 feet high, the shoreline and the hills on the other side of the bay should be hiding it entirely." He says the hills in the foreground should cause the mountain to be entirely obscured in the Round Earth version. I don't have data on the height of those hills in the foreground. I couldn't say whether he is right or wrong. Unless you have all of the data for the hills and can compute what should or should not be seen under RET, I cannot say that your analysis is correct. I'm not going to pick apart the entire video. 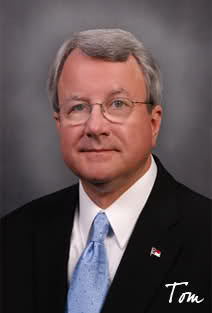 I just want to examine his sighting of San Jacinto from Malibu, which is his capstone. Work with me on this. If the earth is flat, where would you draw eyelevel on this image? I do believe he was shooting from somewhere on Malibu Bluffs park, below Pepperdine University. The elevation varies, but that's enough location detail and he consistently cites 150' as his viewing elevation. So, looking across the bay toward Santa Monica and inland, where is the 150' eye-level drawn on that picture? Here's my opinion. See if we agree and, if not, let's defend our answers. Rationale: For references, I used the 16-story Pacific Plaza on the left that is on Ocean Blvd, elevated about 50' above the beach and rising 180'. And also the La Meridien Delfina hotel on Pico, that's about a half a mile further inland on a 90' elevation. I don't know it's height, but it is a few stories shorter than the Plaza so maybe 140-150'. It's more like 12.5 miles from Malibu Bluffs vice JTolan's note of 12 miles. So that's how I estimate the FE "eye level" line. Agree or do you have a counter? It is indeterminate where the eye level is without knowing the specifics of the lenses in an optical zoom device like that because of collimation. You don't have to be precise. Is it at the water line? The top of the Pacific Plaza? Is my line in the ballpark? What makes sense to you? How did JTolan figure the angular distances for his vertical mrad scale? Is it right? How much collimation do the lenses in the device make for the zoom seen? Without that information the matter is as erroneous as the theodolite dip. Read Earth Not a Globe. I don't agree, but okay. Let me try a different tact then. Do you agree with JTolan's scale? He measures the height of San Jacinto using his scale for which he placed the 0 point aligned with sea level at Santa Monica and 17.5 millirands (about) at the peak, which equates to about 10,800' at a distance 117 miles away. Is that right? I think not, but do you think that's sound? How did he derive his scale? He said he used the building he labeled at 12 miles as an index (the La Meridien Delfina). Is that sound given your position on the indeterminacy of eye level? You're involved in a lot of discussions right now so let me just jump ahead and show you what I'm getting at. If we take that condo building on Ocean Blvd and compare it to JTolan's scale, it measures out at around 5.3 millirands, or 0.3°. At 11.9 miles (62,832') away, that angle results in a vertical distance of 329'. But the Pacific Plaza is not 329' feet tall. It's a 15-story building. Using JTolan's method of estimating height, that works out to 180', which I found corroborated on this Web page. Let's try the La Meridien that he said he used to estimate his scale. This is tougher because I couldn't find any building height data for it, an only roughly estimated it to be about 150' tall. At 10-12 stories, it could be only 75% as tall as the Pacific Plaza, which would make it 135'. Plus, it's tucked away behind some obstacles in the image, so I can't be sure of where it's ground level is. I'll be generous and measure out just what I can see, which is about 2.6 millirands (0.15°). At 12.5 miles away, that's a height of 172'. Even if I use JTolan's distance of 12.0 miles, that's still 166' which is more even than my over-estimate of 150', and that's with skewing everything to try to make it fit. Let's use the Pacific Plaza, with a confirmed height of 180' and a measured distance of 11.9 miles to build an alternative scale. The problem now is that while it appears to rectify the angular dimensions of the buildings in the foreground, San Jacinto is no longer mating up with the 17 millirands that JTolan found as confirmation of a flat earth. Do you have any critique of my proposed reticle/index, Tom? Or do you have a defense for JTolen's? Assessing what we're seeing in the distance and discerning flatness or curvature of the earth pretty much depends on it. I'd rather not go through the process if you're going to harbor criticisms of the scale. Can we resolve that first? I've given it a few days, so in the absence of any negative assessment, I'll proceed under the assumption my scale is correct and JTolen's is wrong. That obscuring ridge is 450-480' above mean sea level, 19.9 miles away from the 150' vantage point on Malibu Bluffs and about 8 miles inland from the Santa Monica beach. I can provide supporting arguments for that if you like, but only if you want to contest it. (The closer ridge you can see is a mile closer and about 120' lower, but it's not an obscuring factor. It's just an aid in identification. The 10,800' peak of San Jacinto lies 97 more miles beyond that ridge. 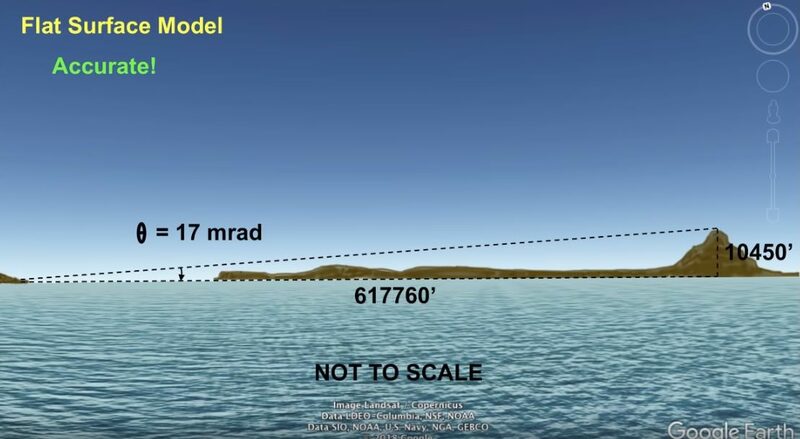 Without considering atmospheric refraction, I calculated that 1455' of San Jacinto should be visible from 150' Malibu Bluffs on a globe earth if that ridge is 450' high. 1293' if the ridge is 480' high. 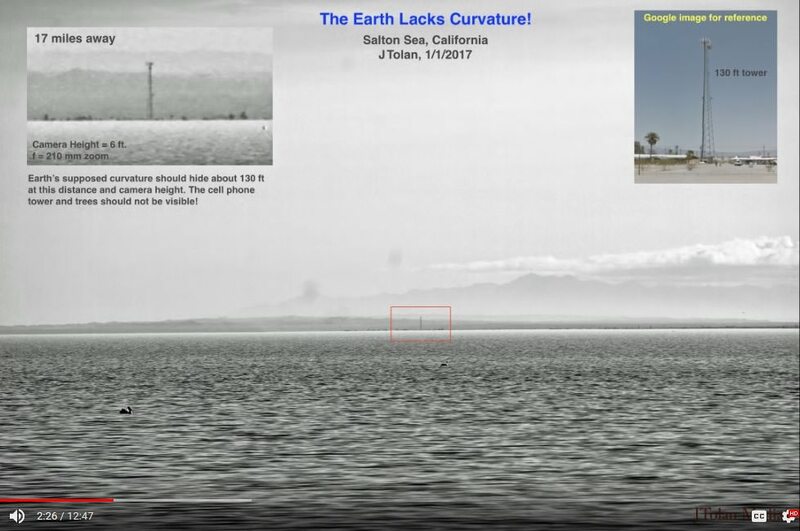 With standard refraction those figures would increase some, but a no-refraction calculation is the worst case, and even then JTolan would be wrong about San Jacinto not being visible if the earth is curved. Working it out for a flat earth, 8925' of San Jacinto should be visible over that ridge if it's 450' and 8708' if the ridge is 480'. Again, I can show my work if you want. How much of San Jacinto is, in fact, visible? By my index, 4.3 milliradians, or 0.25°. At 117 miles, that works out to be 2652' of San Jacinto is visible in that image. 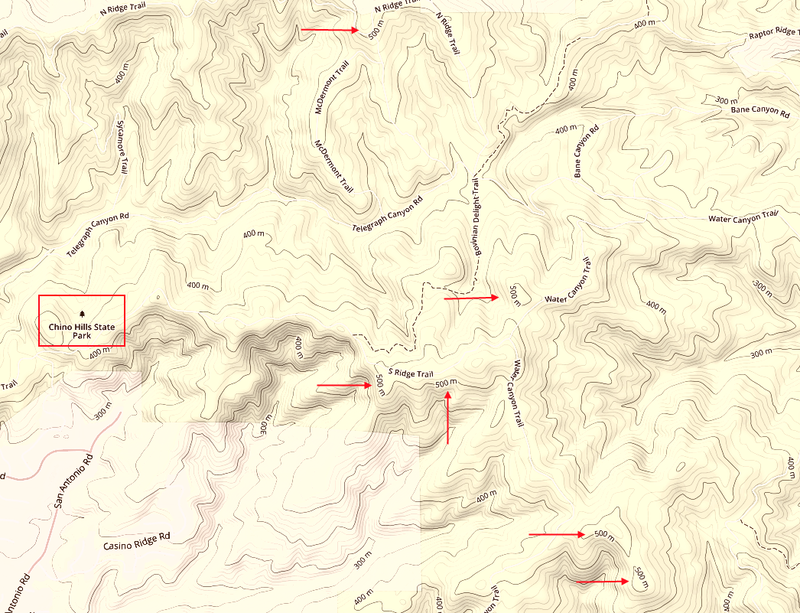 Which corresponds to elevations from below 8300' (Fullers Ridge visible) but above 7600' (Black Mountain not visible). That would means we're seeing somewhere around the upper 3000' of the mountain range there. My mrad scale figured 2652'. 348' at 117 miles is 1/2 a millirand. Perhaps my scale is still slightly off. I had no success getting any images of the upper 4500' (and certainly not the 8700+ feet) of mountain range to match the IR image that might support a flat earth claim. Maybe someone more inclined toward flat earth can. This still doesn't serve as a "win" for a globe earth since there's still a significant delta between the no-refraction prediction of San Jacinto visibility and what my analysis of the imagery is saying is visible. Even figuring for refraction (which I haven't done yet, but just estimating), I think globe earth only gains an addition 500-600' of predicted visibility, which is still not quite there. There's a lot of estimating here, but it's not just shots in the dark. Whatever the margin for error, it's much, much closer to validating a globe earth than a flat earth. JTolan's scale is off. He positions it incorrectly. And he misinterprets just how much of San Jacinto is visible. He also incorrectly depicts that the mountain should be entirely obscured if the earth is curved. I argue that his imagery more closely shows what a globe earth predicts than a flat earth. I don't think his errors are intentional. 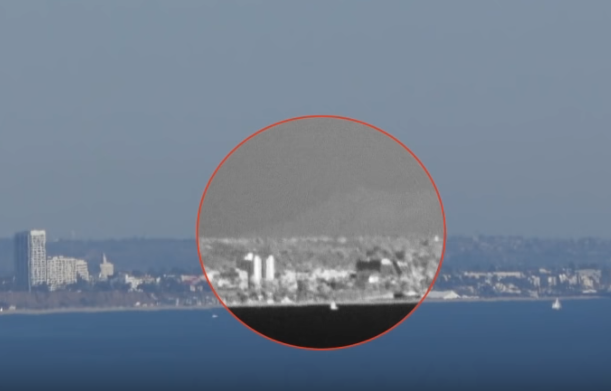 I think he's just mistaken, caught up in the excitement of making the distant mountains visible through the haze with his IR set up as if he's uncovered something that shouldn't be visible on a curved earth. Maybe my calculations are wrong. Maybe I'm caught up a round earth premise and making my analysis fit what I already believe. Maybe. But if so, show me where I've goofed up. I think I'm on the right track, but I welcome reasoned review. That 450' ridge of Ladera Hills just 20 miles from the Malibu viewpoint is aligned much too high up the slope of San Jacinto for the earth to be flat. 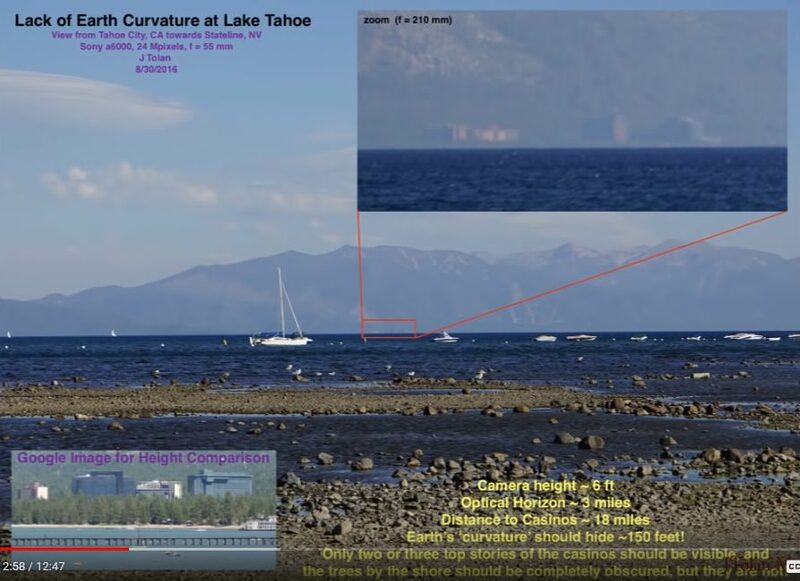 The videographer misinterprets just how much of San Jacinto he is seeing, fooled by the looming of the telephoto image and the incorrect millirand angular index he had created. 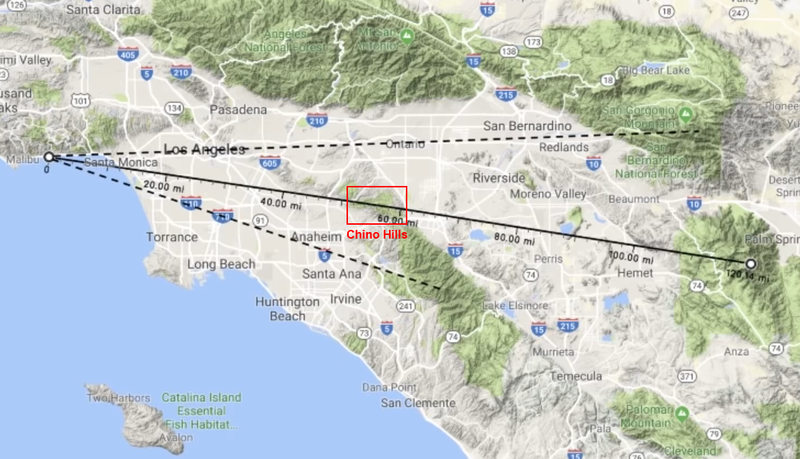 Also, if the earth was flat, the Chino Hills breaching 1500' at around 55-60 miles (halfway from Malibu Bluffs to San Jacinto) would be high enough to peek above that 450' ridgeline at 20 miles. On a globe earth, the surface would drop too far by then to be able to see 1500' hills beyond that near ridge. And, as JTolen's video reveals, we don't see the Chino Hills. We don't see any other intermediate distant features beyond that Ladera Hills ridgeline until the land elevation reaches over 8000' MSL. That's not a flat earth signature. That's a spherical earth. I will say this though. I like the IR filter with spotter scope set up. I want to use something like that to spot the horizon, looking toward San Clemente and Catalina islands, around 65-70 miles off the cost. I know there are times one can see them from San Diego with a little elevation, but since I've been hawking it, the marine horizon to that distance has been cloaked in haze. I accidentally captured Catalina during a sunset last April, when the setting sun provided backlight and cut through the haze. The man in that video seems to be talking about the wrong hills, and trying to estimate the height of that building seems like a fruitless effort since we do not have the architectural height information, do not know how many window panes there are per floor on that building, and we cannot see the entirety of that building from top to bottom. There is a bunch of stuff towards the bottom of the building blocking the view. Man saw 10,800 foot tall tall mountain that was 120 miles away, with an eye height elevation of 150 feet. Now how about the hills in between the observer and the mountain? I was prepping to respond, but I see you've edited. Nothing wrong with that. Just let me know when you're done. I'm done editing. But most of this seems like a waste of time since this isn't a water convexity experiment. Most of this experiment takes place over land, not water. We are assuming that land behaves like water. It's geometry. We're comparing calculations for a regular flat and convex surface and factoring in irregularities (a.k.a. hills). We're even ignoring effects of atmospheric refraction. If it's a waste of time, why did you post the link to the video in the first place? 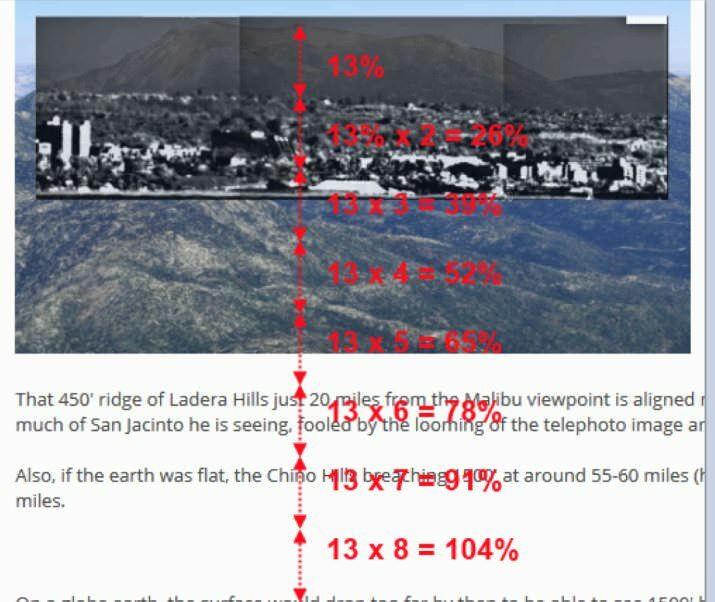 It extols the virtues of a flat earth, but now even if you think that land obstruction is Chino Hills 55 miles distant, you're still debunking the videographer who says San Jacinto mountain shouldn't be visible if earth is spherical. My earlier calculation came to about 13% visible as a globe earth predicts w/o refraction. Using different measures you came up with 11% visible. Even with errors not favoring a spherical earth you've invalidated a key premise of that video. If it's a waste of time, why did you post the link to the video in the first place? There are a bunch of water convexity experiments in those videos I posted. I posted two other videos in that thread in the Media forum. All others are water convexity experiments, which you have ignored. 6+ experiments showing that the earth is flat, and 1 experiment that you think shows that the earth is round? This mountain experiment isn't even a water convexity experiment. Most of the experiment is taken over land. I'm not sure how accurate we are by assuming that the land behaves like water. Yeah. It's the only one I looked at out of your list. I never got past it. The infrared filter appealed to me since I've been frustrated by the summer SoCal atmospheric haze and I found the technique to have potential for the horizon experiments/observations. If you think that video is not like the others, disavow it then. You should, because despite the narration, it is supporting a convex earth. I have no idea if the others are valid or not. I got caught up in the JTolen Media one. Sorry, but that's what this thread is about, and I initiated it because you asked and that other board is apparently not the place to comment on it. If you want to address the other videos, by all means, create discussion topics about them. This one is about the Malibu to San Jacinto IR viewing. Let's stick to that on this topic. Yeah, that is odd. I wrote about that already. Though I calculated a non-refractive 13% of the mountain to be visible on a globe earth (1455'), my angular analysis of the imagery was that 2000-2500 feet is actually visible, or 19-23%. The fact that we see more of the mountain than what no-atmosphere, no-refraction geometry figures to isn't proof of earth's flatness. 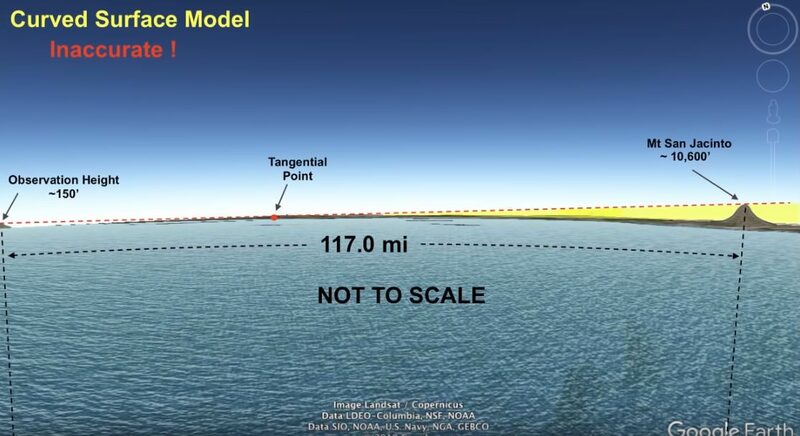 Work out the figures for a flat topology and how much of San Jacinto should be visible if that obstruction is the Chino Hills at 1647' elevation 55 miles away? I came up with 7300' or 68%. My 13% no-refraction globe earth calculation is closer to the observed 23% than is the 68% flat earth calculation. You need some "bendy light" fudge factor to make up that 45% delta. I only need to make up 10% from the other direction, some of which could easily be accounted for with refraction, bending light the other way. And yes, if the earth is a globe of radius 3959 miles, then that IS where sea level would appear if you could peer through the earth. 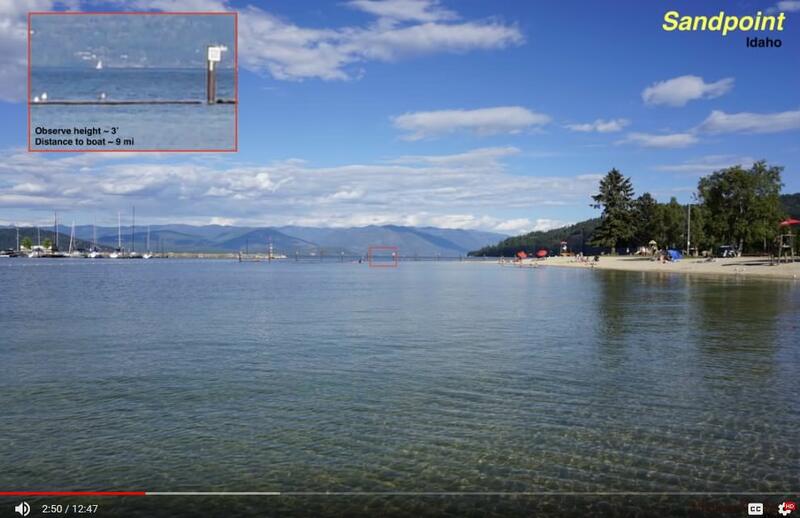 On a flat earth sea level would be at eye level, but you can't (or won't) even hazard an estimate as to where "eye level" is on the image.